Get a check on the spot for your motorcycle, ATV, snowmobile or other recreational vehicle. You are going to love working with the industry leader in the vehicle purchasing industry. We are bonded and insured so you can rest easy knowing that you will get every penny we agree to pay you. With over 350 locations in the USA, we can dispatch a team member to pick up your motorcycle, ATV, snowmobile, or whatever today! The Bike Buyers makes it easy to sell your motorcycle, ATV, snowmobile or other recreational vehicle fast. Get your money (paid by check) on the spot before we leave with your vehicle. Step 1: Call us today at 877-751-8019 or click Get a Quote Now – and we will reply quickly so be ready! We buy motorcycles, sport bikes, ATV’s, snowmobiles and other recreations vehicles every day. You receive a check on the spot before we take the vehicle away for you and we operate almost everywhere in the USA. The Bike Buyers makes it easy for you to get paid for your motorcycle, ATV, snowmobile or other recreation vehicle and use that money right away. Time is and money so don’t delay or call a less experienced Bike Buyer! We work hard to ensure that your experience is second to none. In order to get the most for your motorcycle, ATV, snowmobile or other recreational vehicle, we first need to know the condition and location. Call 877-751-8019 to speak to one of our experienced and helpful representatives who will be happy to learn about the vehicle you are selling and make you an offer. We work hard to help you get paid the same day for your motorcycle, ATV, snowmobile or other recreational vehicle. 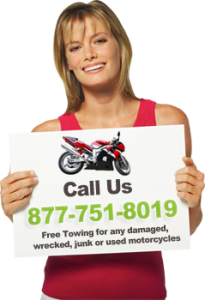 We understand that you want the best price for your motorcycle, ATV, snowmobile or other recreational vehicle so we work hard to make you the best offer when you sell your motorcycle for cash. Once you complete the form Get a Quote Now and submit request for a free quote, one of our friendly representatives will follow up with you typically on the same day. They will answer all of your questions and work with you to get the highest price for your motorcycle, ATV, snowmobile or other recreational vehicle. When we agree to a price, and you are ready to get your vehicle picked up, you will get paid on the spot! Now your bike is ready to be picked up and you are ready to get paid! You can drop of the vehicle at a local drop-off location or we will sent one of our bonded and insured representatives to your location, pick up your vehicle and hand you a check that you can cash the same day. There will not be any change to the price we agree to pay…if we agree on $500…that is what you will get…not a penny less. It’s that easy! Say goodbye to that motorcycle, ATV, snowmobile or other recreational vehicle and get paid today!